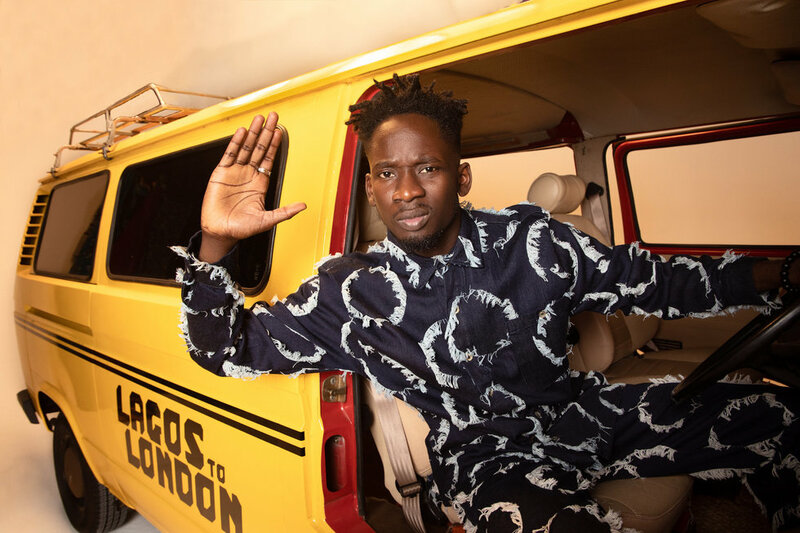 From Lagos to London to the United States, Mr Eazi's name carries tremendous weight. With his 2015 single "Skin Tight" and the subsequent knock-out blow of "Leg Over" giving him the momentum he needed to break through to the mainstream light, the Nigerian singer, songwriter, and entrepreneur has since built an international fanbase, performing and shutting down stages all across the globe. 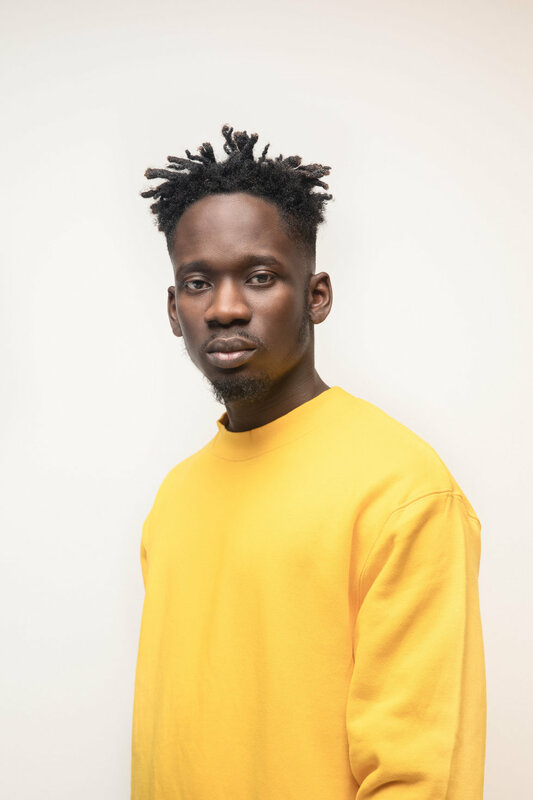 Eazi has positioned himself to be one of the most well-respected Nigerian artists out right now, leaving you in disbelief that it was only two years ago he was answering phone calls for a living. In 2018, he wrapped up a US tour opening for J Balvin before unleashing Life is Eazi Vol 2 - Lagos To London, with features from Diplo, Burna Boy, Chronixx, and Giggs. 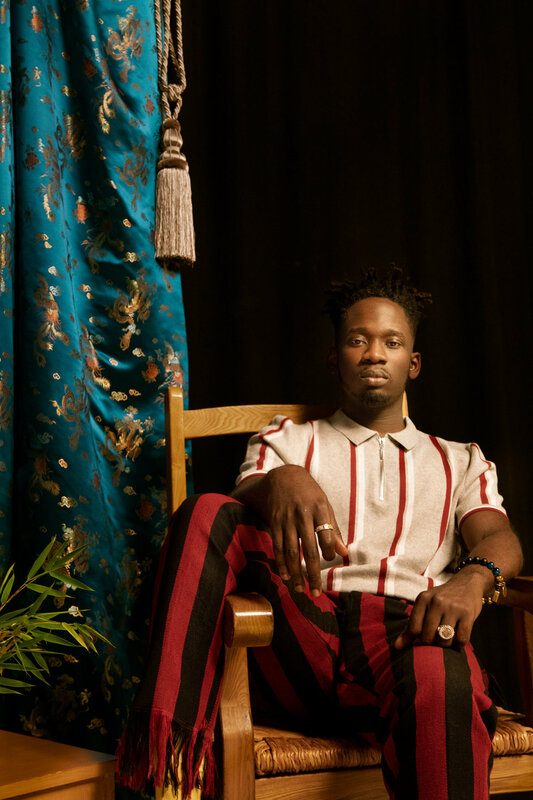 While his roots lie in afrofusion, and it's his ability to break down genre barriers and create his own lane of Nigerian pop that listeners can't help but gravitate towards. How do you bring Nigerian and Ghanaian sounds together? That's a tough one. For me, it comes natural. I'm a product of both cultures. I was born in Nigeria, then had an upbringing in Ghana. From 15 to 22, I was in Ghana. I guess it comes natural to me, because that's who I am and who I've become. First of all, I'm African. Second of all, the music has made me understand and investigate what it means to even be African. Be connected to Africa in culture, people, energy, and also the similarities between all of us at the same time. What was your upbringing like in the household? I'm the first son, second of four. Not going to lie, my sister raised me. My older sister was like my second mom. I just learned a lot from her, my parents, friends, business people. It spans from my love for business and trading. I remember my dad wouldn't be around because he was in the military. Any time he came, he would make breakfast for us. When the tea was hot, he would do this trick, and he'd be playing reggae music in the background. That made me just love reggae music early on, because I attached it to my dad's presence. I'd like to think I had a fun childhood. My parents always made us feel like we could do anything. I've had different careers throughout the years, but there's always been support on the home front. You just released your mixtape Life is Eazi Vol. 2 - Lagos to London. How has the reception been? The reception has been humbling. I remember one week after the release, I was in Zimbabwe and I had to do a two-hour set because people were already hip to the songs on the new mixtape. From there, I had to do listening parties in Kenya, Uganda, Tanzania, basically a couple countries along East Africa. It's been a blessing. One thing I've noticed is that every place has found their song [from the mixtape], which is a blessing and a curse at the same time. For instance, Ghana has grabbed "Dabebi" the single, meanwhile Nigeria has "Surrender" as the single, Kenya has taken "Keys to the City" as the single, the Middle East and UK has taken "Chicken Curry." Gosh, how do you promote a project that has multiple singles? Do you find the reception to your music changes depending which continent you're in? Did you feel pressure because of the success of Life Is Eazi Vol. 1? I'm not going to lie, I only started feeling some type of way a week after I released Vol. 2. Even though the numbers were maybe four times better than Vol. 1, I properly soaked it in when I was driving in my car playing Vol. 1. I was like "oh my god, this is actually good." That was the first time I was soaking the music from Vol. 1 as a fan just listening to the music. But then again, it's a continuation of a story. I wouldn't say it's pressure, it's just like "On to the next one. Okay, let's see how to exploit this one and move on with different ideas in my head." While recording, I'm having to hold myself back. Did you feel pressure to make a "Leg Over" 2.0? Nah, I never set out to make a song. It's whatever comes. I don't think it's possible to make another leg of that. You always feel like "oh this is my best song," and then tomorrow, you've got another one. You got to enjoy the ride. What's your favorite track off Vol. 2? It changes. Right now, it's "Chicken Curry." What was your favorite session from Vol. 2? The session where I made "London Town," because it was the session I did with Giggs. All of London was in the studio and the energy... it was a different experience for me. Because usually when I'm recording, it's just me and my producer. I'm just chillin' by the bed or sitting down in my chair and recording, but this was different. The sound was a big thing. It was real fun because everybody there was vibing. That's when I started recording with Giggs for a long time. I started leaning towards having a lot of people in the room when I'm recording to bring that same energy. What was the creative process and how long did it take you? I got the beat around 6pm, then I played it for Giggs over the phone. He loved it. He's like "send it through." I start recording at 8pm, then I had to run to some awards at 9pm. I met with Giggs at the studio at like 11pm, then we're done at 12am. You have everyone from Diplo to Chronixx to Burna Boy to Giggs. Talk about who you choose to collaborate with and why. My tour driver actually introduced me to Chronixx's music, and I didn't know my tour driver was doing the same for Chronixx with my music. I wanted to work with him but also, I always thought after Lagos To London, my next project might appeal towards the Caribbean. The fact that I respect Chronixx's music, I also wanted to hint my fans of where the next destination might go. I wanted to get my fans ready. I've been a Burna Boy fan since before I started doing music. I actually booked him—I went in my previous life as a promoter—and brought Burna Boy to Kumasi in Ghana. When it was time to do this project, he was definitely number one on my list to collaborate with. As a friend, mentor, and I like the way he uses music to bridge gaps between cultures. That's why we've made a couple songs. I always want to make songs with him, because it's always a different take. It's still the same sound, but there's something about his production and ears that can even make the music more global. Because it's coming from a place of bridging gaps, and I'm coming from that place as well. 2Baba is a legend. I'm a huge fan of 2face. I always wanted to do a song with 2Baba at some point. When I made the "Suffer Head" beat, I just knew it was 2Baba that would be on it. Simi, I love her voice. On "Surrender," I just knew her voice was suit. It was a no-brainer. You mention one of your highlights last year was when Giggs brought you out on Wireless Stage. Bring us back to that moment. It was more of the fact that before then — I performed the song on the day of release at Republic. After that, I had not performed the song up until Wireless. So when Giggs told me he wanted me to come out at Wireless, I was like "ooh, are you sure?" I wasn't sure how the song was doing on the streets, on the grounds. Sometimes, you find that something is doing well on streaming, but you go live and it's vice versa. I wasn't sure, but once I came out and heard the screams and sing backs, I just knew that we got one. Talk about recording in London and how that's influenced your career. Every time I want to work on a project, I spend more time there. Last year, I spent more time in Ghana. I was more concerned obviously doing a lot more stuff with UK producers and artists, and that definitely influenced my sound. My sound kind of every day leans to be more... stripped down. I've always made stripped down music, but spending so much time in the UK over the past year has made me feel free to strip it down even more. Can you talk about your journey with Diplo's Mad Decent? I've done a couple licensing deals and partnerships with Mad Decent and my label Banku Music. The goal is basically to experiment and have more hands on deck pushing the music globally. For Mad Decent, specifically in North America. We've put out "Leg Over" remix and "Pour Me Water" together in North America, and I'd like to think Mad Decent was a part of the growth. There's only been positive stories, and Mad Decent has been a part of it. Diplo and I have been collaborating from touring to music, it's been awesome. I love seeing that Diplo wanted your African roots to influence US artists. Do you think it has? I feel like it's continuous. We have so many songs. We have a project, but I feel like it's still been step by step. I mean ultimately, that could happen. From sound influences… even when we talk, it's not just me. It's the entire sound coming from Africa: African artists and African producers. You can see the influence on a couple US tracks. Last year, you could hear the record with Janet Jackson produced by a Nigerian producer that had the Afropop drums and feel to it. Same thing, you can see the dance moves in Chris Brown's new video for "Unapologetic." It's not just me and it's not just me and Diplo, it's the entire Afro wave. It's already happened. Best memory on tour with J Balvin? The best memory was the first gig, coming out for the first time ever in my life. I was super scared going on stage. [chuckles] The lights were on. Everybody was looking at me for the first time ever. Once I start performing, I've always had people who knew my songs. But performing to a crowd where 99 percent of people never heard of me before, it was really special. At the same time, humbling and challenging. I interviewed Michael Brun who's made it his goal to put on for Haiti. Do you feel that same passion? That's what I do, whether I realize it or not. That's what happens. I represent not only my country Nigeria, but the entire continent. It's blessings. Flying multiple flags and having young people from these countries look up to you as someone who's representing, I can't thank God enough. Tell us about the new Empawa initiative you've started. It's a program where I get to fund 100 African emerging artists. We had over 20,000 entries on Instagram via the #Enpawa100 hashtag. These were simple IG videos of kids rapping, singing, doing whatever. We had to go through it and pick our favorite 100 from across Africa. We started to shoot videos for everyone of them except four. Some of those I already got rotation on African radio and TV. We just dropped one that went straight to #1 on the Ghana Apple Music charts, and has been trending all day. It's just beautiful seeing how I can give back to my ecosystem and ignite 100, 50, 10—even if it's one new artist. And it goes beyond that. We're trying to make sure we have a couple more music premieres (such as myself) coming out of Africa who are independent, global artists. Which other African artists are you influenced by or listening to these days? These days, I'm listening to the new kids, mostly the guys from Empawa. Each artist except for maybe three to four songs, my entire playlist is full of unreleased music. People like J Derobie, who just dropped a video, to Lady Donli to Addison—all the names you've probably never heard of. 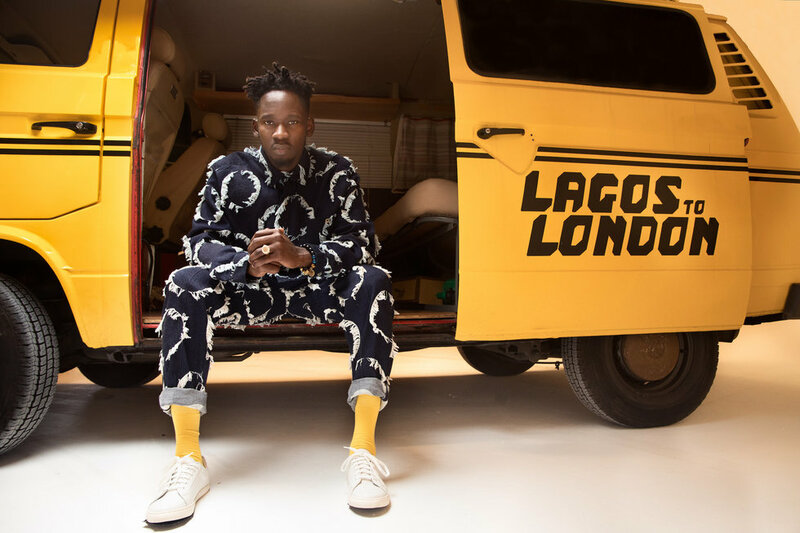 What's a normal day in the life of Eazi? Walk us through. I wake up at 5 or 6am. Then I go around checking emails and then go on my Twitter, go on my Instagram and see what's going on. Go on Instagram see what's going on. Start being a busy body checking on business. After some time, I'll call E-Kelly or GuiltyBeatz like "it's time to make music." It's always between business, social media, and making music. Three things you need in the studio. I need WiFi. I need tea, like ginger tea. And I need some form of distraction. It can be food, or something who has nothing to do with music. Just some form of distraction so when there's a block, I can just relax. Nah. I just said to myself this year, "I got to do a song with a K-pop artist." I'm obsessed with them, so I'm looking forward to doing that. What are you most excited for performing at Coachella this year? I'm most excited to get up on that stage and perform to crowds of people. Seeing their reaction to my songs. Ensuring people have a great time whilst ensuring I create a moment and an everlasting memory!